Coffey Insurance: 41st Earth Day! Today marks the 41st Earth Day. Earth Day is an celebration of the environment movement and ecological awareness. Millions of Americans each year pledge to reduce, reuse and recycle, and participate in programs and rallies in their communities for the purpose of helping the environment. In 1970, Wisconsin Senator Gaylord Nelson created Earth Day. “The objective was to get a nationwide demonstration of concern for the environment so large that it would shake the political establishment out of its lethargy, and, finally, force this issue permanently onto the national political agenda” Senator Nelson said. Senator Nelson’s wishes certainly came true, as in July of 1970 the Environmental Protection Agency was created to enforce pollution legislation, and Earth Day would become an annual event! 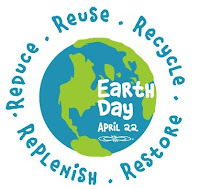 You can learn more about Earth Day by visiting the EPA’s site, and find out about events and ways to help in your community. Winnie and Phinn just love the outdoors, and want you to help out anyway you can! Until next time..